May 3, 2016 By Allyson 7 Comments This post may contain affiliate links. Read my disclosure policy. 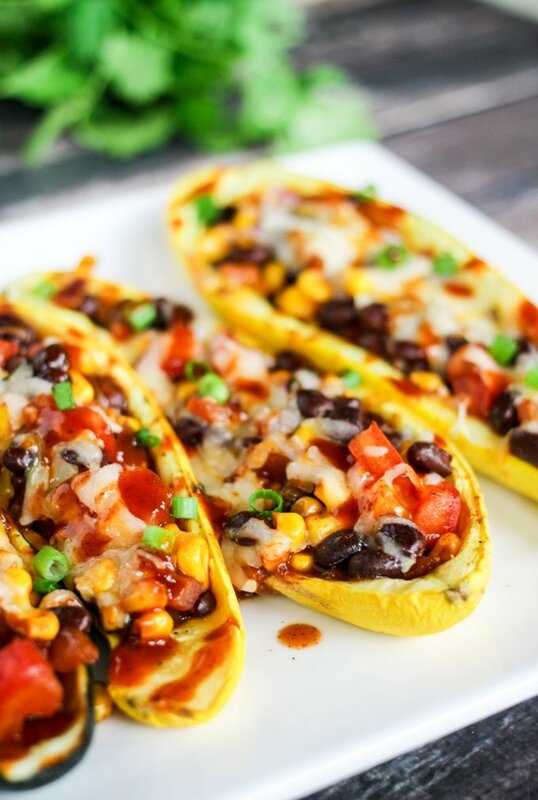 These Southwestern Stuffed Zucchini Boats are easy, delicious, and majorly healthy! only 127 calories per serving!!! As most of you know, I have been trying to come up with lots of new healthy recipes, and I’ve been trying out lots of fun new food fads recently. Lately I have been playing a lot with zucchini, because it’s really so delicious and healthy. You can pretty much incorporate it into anything, and it takes on the flavor of what you are mixing it with. I have been obsessed with ‘Zoodles’ or zucchini noodles, and now I am equally obsessed with zucchini boats! 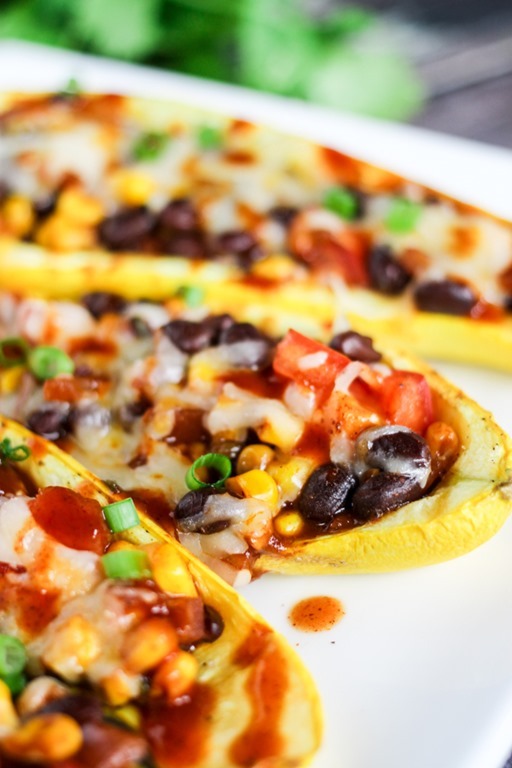 I have a couple great recipes to share with you in the next few weeks, but you have to try these Southwestern Stuffed Zucchini Boats – they are easy, delicious, and majorly healthy (see bottom for nutritional information)! 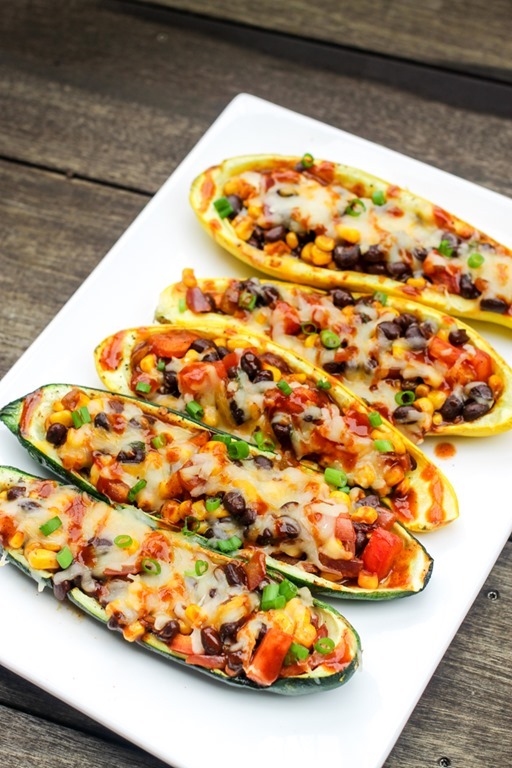 Using the southwestern filling in these zucchini boats, takes them to a really great place. You can customize the spice level to your liking, and add or leave out any ingredients you want. They are very versatile and easy to make. This is a vegetarian dish, which is great for anytime or a meatless Monday recipe. You could also add meat if you want – I think even a shredded rotisserie chicken would be great here; just mix it with the filling and get on with things. Zucchinis are always plentiful during the summer, so it’s easy to pick them up when they are really cheap, and then use throughout the week. 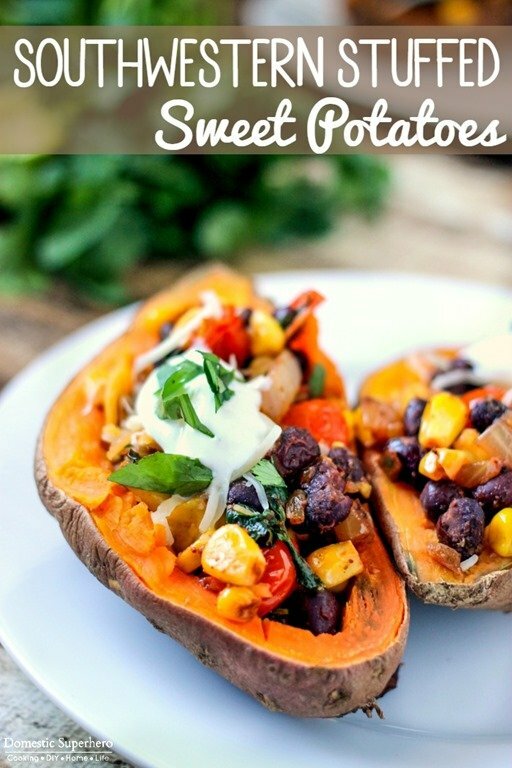 You could make these, some Zoodles, and maybe double the filling and use it in a Southwestern Stuffed Sweet Potato! The options are endless! 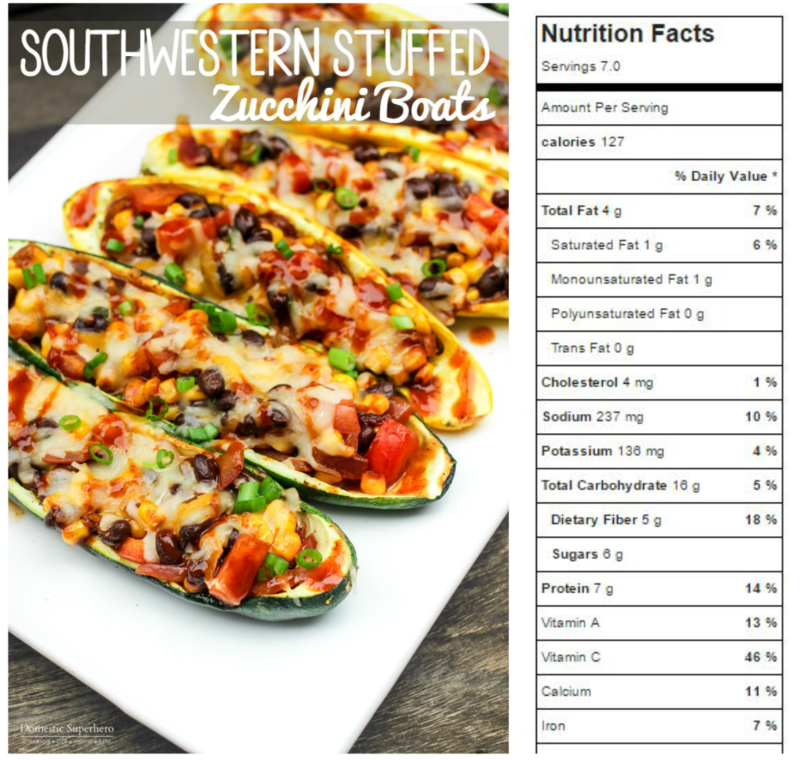 With only about 127 calories (see bottom for nutritional info) per zucchini boat, you can easily eat 2 of these plus something else for dinner and not feel guilty! They are so filling, too! Using a large baking dish, add zucchini halves flesh side up, and lightly brush the tops with olive oil (should use about 1/2 oil TBS total). 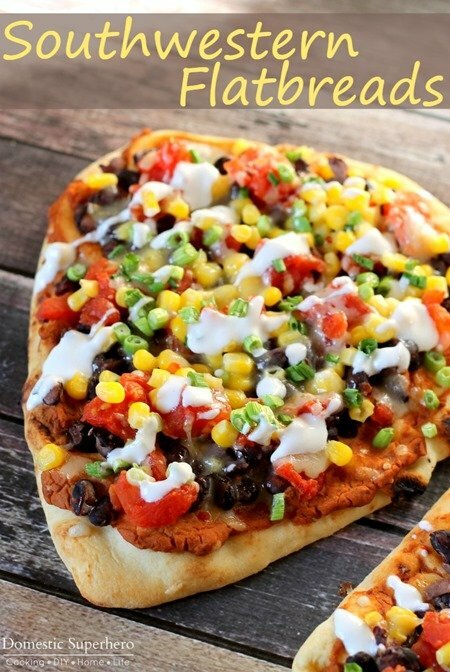 Place into oven and bake for 20-25 minutes. While the zucchini is cooking, add the remaining 1/2 TBS olive oil to a skillet, and add red onion and green chilis; saute for 3-4 minutes. Add cumin and chili pepper; stir. Add beans, corn, and tomatoes and saute for 2 minutes. Add lime and cilantro; stir and cook for 1 minutes. Remove from skillet and set aside. 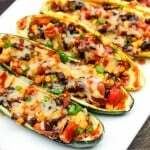 Fill zucchini boats with southwestern filling, then pour the enchilada sauce over the tops, add shredded cheese and green onions on top. Place back into the oven and cook for 5 minutes or until cheese is melted. Try to use zucchinis that are wide and the same shapes - this will make cooking easier. 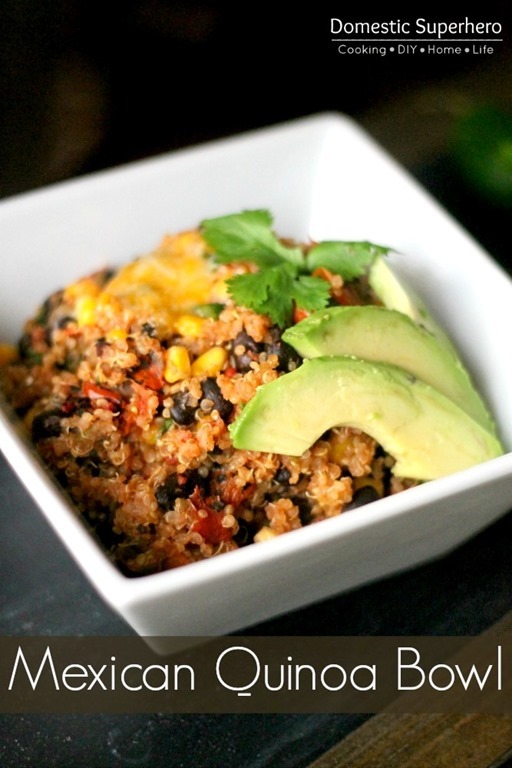 Like Mexican and healthy recipes as much as I do? Check these out! Love these flavors together! 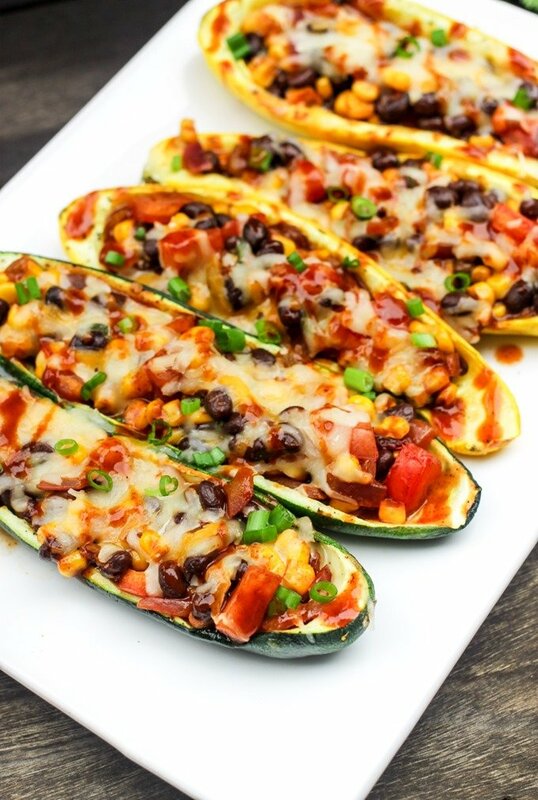 And the zucchini boats look great – but the idea of making double, and having a different meal with the second batch is so much more appealing than repeating the same meal again!!! Can this filling be frozen successfully? Thanks! You know, I haven’t tried freezing the filling, but I would be optimistic it would freeze well! I am going to try that next time I make these. If you try it, please come back and let me know how it turned out! Thanks, Bec! What brand of enchilada sauce do you recommend buying?? I make my own – here’s the recipe! 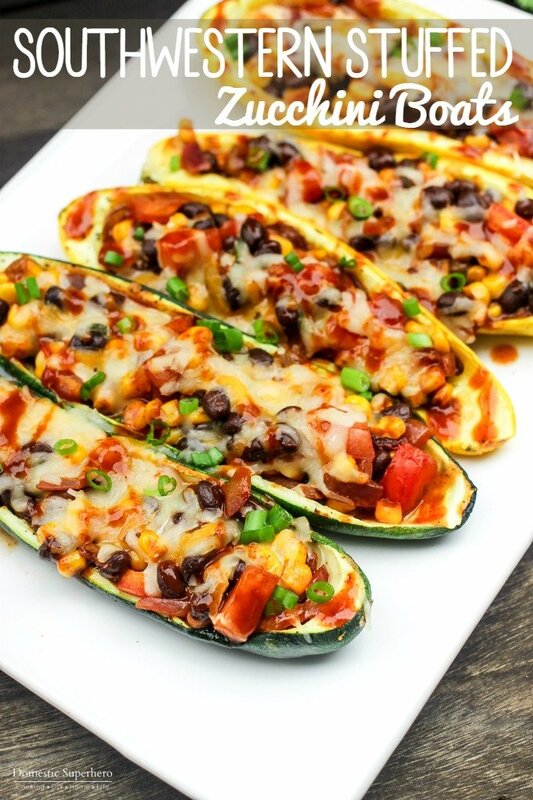 This looks good but where is the zucchini that you took out? Don’t you use it in the recipe?